The K-State Trumpet Ensemble made university history on Jan. 20 by being selected as semifinalists for the National Trumpet Competition. 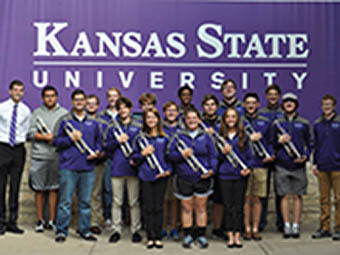 Student trumpeter players Abby Giles, Sarah Grose, Lucas Johnson, Kyle Lefler, Steven Schmoll and Hunter Sullivan will be the first students from K-State to ever compete on this national platform. The group will travel to Denver in March to compete with trumpet ensembles from all over the country.